Day 25 - 26 The guys left mid afternoon on Tuesday and sailed offshore to Marathon. I spoke to Bruce on Wednesday morning while they were in route. 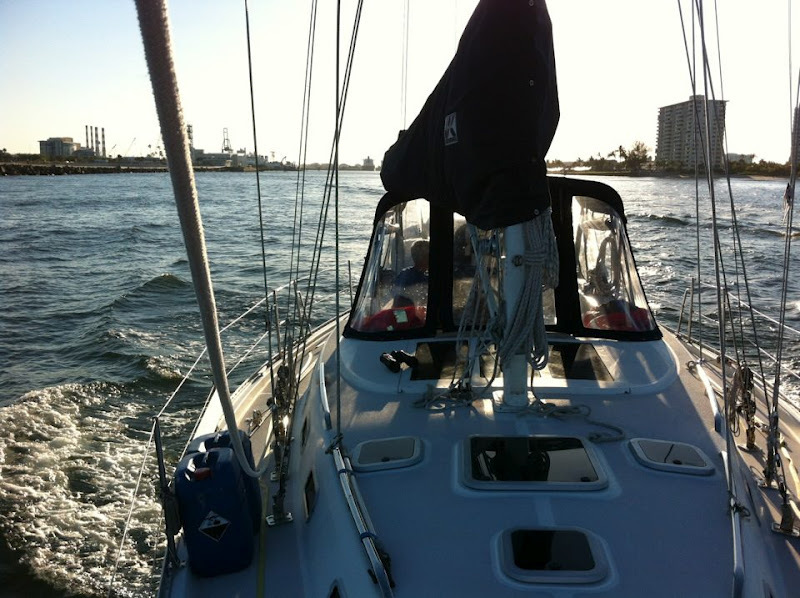 He had just settled in on his watch and he said that they were doing 5+ knots in about 100 ft. They had sailed out further offshore but felt that the Gulf Stream was too strong so they came back in and kept it at about 90-100 ft depths. Bruce said the watches were easy, Chuck stayed up past his sleep so Bruce stayed on for 2 hours after Chuck went to bed. He entertained himself charting their position every 10 or 15 minutes. Good practice for him. 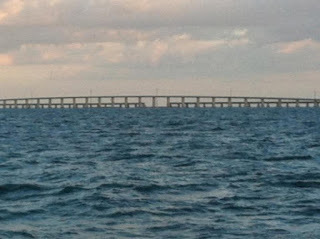 Late in the day as they neared Marathon, they made the decision to go under the 7 Mile Bridge instead of going all the way around the keys, but they wanted to navigate in good light… so they stopped in Marathon for the night. I think it was actually the beer and big fat greasy burgers at Burdines that helped them to make the decision to stop for the night. As they pulled up to the fuel dock, Chuck sweet talked the attendant into a free place to stay, although there was some mention of a tip when Bruce paid the fuel bill. Thursday morning they were up and on their way bright and early. They made it under the bridge. Bruce said it had actually been more tricky getting into Marathon than leaving. They said goodbye to Florida. Kevin had travelled this route before in a boat with 6 ft draft and promised that he could do it again. 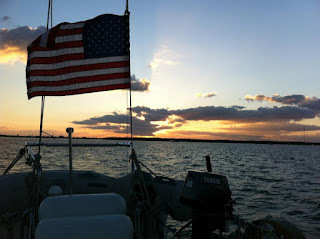 Chuck was concerned that there would be a grounding in their near future, but Kevin steered the boat successfully over the reef and into the Blue Waters of the Gulf. Kevin had been working on getting the single sideband radio running, and between he and Chuck, they got it to go. They now had a source of weather information as well as contact with Kevin's wife, Kerry. This gave me peace of mind as I knew they had contact with the world. Kevin has crossed the Gulf many times and has formed some theories about the best way to avoid the currents of the Gulf Stream that can cause the crossing to be unpleasant. He convinced Chuck and Bruce that taking the more Southern route straight across the middle instead of hugging the coast would be the better option. 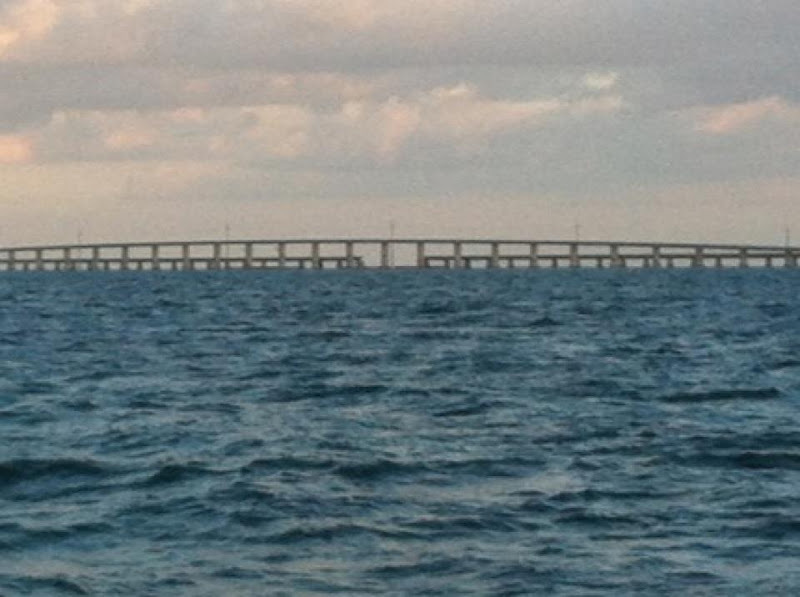 With some lingering doubts in their minds, they agreed to try it and were rewarded with an almost placid Gulf crossing. The winds were generally around 10 knots on the stern and seas were around 3 ft at the most. The boat rocked its way across the Gulf with the biggest concern being to keep the main from accidentally jibing and keeping themselves fed... for 6 more days... The crossing was so benign that in fact, the guys hardly got "credit" for it since they weren't beaten and bashed. Day 32 - The arrival! I took Thursday and Friday off work so that I could be a part of the excitement. No way could I sit at my desk and be productive. No way could I miss the first days of the rest of my life! Dos Libras arrived at the Port A jetties in the early hours of that Thursday morning. 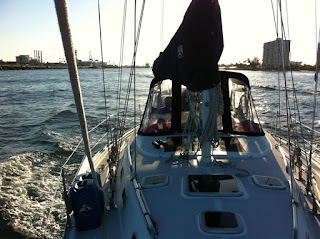 Chuck was on watch when Bruce awoke and joined him thinking they had yet to reach the GPS waypoint for the outer jetty. He soon found that they had already PASSED it and were nearing the looming jetties. He was just in time to assure a safe passage into the Corpus Christi Ship Channel. Our slip wasn't ready as the "island time" mentality which prevails in Port Aransas had kept the pile setters from getting to it... so the guys pulled up to the old "long dock" and settled in to await my arrival. They were tired but happy! They had made it! Ending the trip with a celebratory beer didn't seem right as the sun was just coming up. And what of Serendipity? Looking back to that February day when we got a phone call from young Chris, asking to see our boat... this whole string of events has been a series of things "falling together" for us... a series of happy accidents. The final crowning glory manifested itself when we started the engine up to move from the long dock to our slip. Bruce had spent a couple of days replacing the solenoid on the engine and other minor chores while we waited for the piles to be reset in our slip. Finally the slip was ready and we started the engine. I took my place at the helm. Bruce untied the docklines as I spun the wheel. "Bruce, is the wheel supposed to spin like this? " OMG! Tie the lines back up! The master link on the steering cable had broken! The boat made it all the way from Rhode Island to Port Aransas... over a month of travel, only to give it up when they were safely tied to the dock. Well believe what you will... but Karma or my Guardian Angel...someone was surely watching over us... or we can just agree on serendipity.